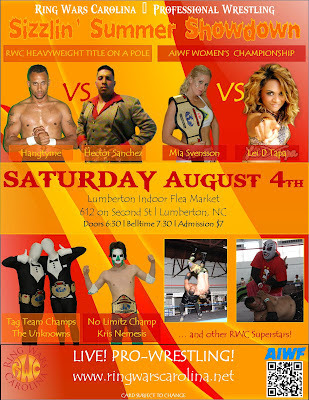 The New RWC Tag Team Champions, The Unknowns, will be making their 1st Title defense. Kris Nemesis will be trying to hold on to the No Limitz Title. The Battle to end the war: RWC Title on a Pole. The first one to get it is the Champion. "Dirty" Hector Sanchez takes on Hangtyme in a showdown that could only make history. This has never been done in RWC. This is the last time these 2 will face off for the RWC Heavyweight Title. The AIWF Womens Title will be on the line as the Champion Mia Svensson takes on debuting Lei D Tapa. This young lady is running over the competition and she wants the AIWF Title for her trophy case. Long Line of champions in her bloodline. Two Sizzlin' Hot ladies plus one Championship equals a can't lose for you! See you Saturday, August 4 as RWC returns to Lumberton, NC at the Lumberton Indoor Flea Market for Sizzlin Summer Showdown! !